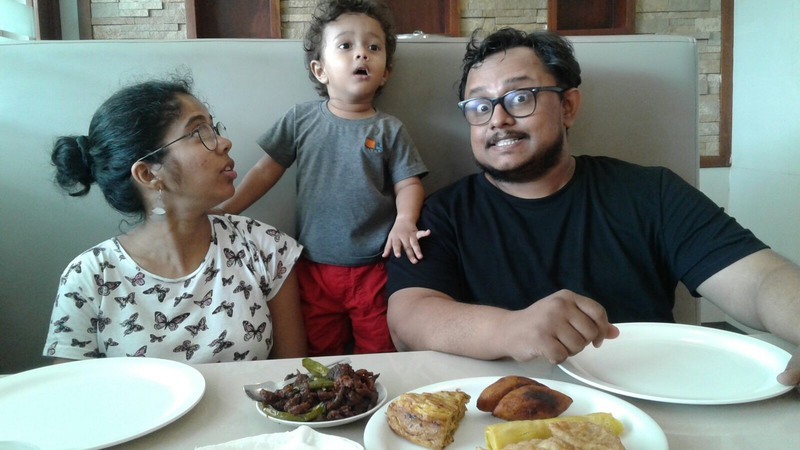 Fahad Faizal, illustrator and animator, has illustrated two books - Unni's Wish and Fly in Space for Pratham Books this year. He started drawing at the age of three and hasn’t stopped since. He is married to Sunaina, his classmate from NID, and they work together from their cozy home-studio in Kochi calling it BABAKIKI. Fahad is a foodie, he loves cycling and tending to the plants in his balcony garden. But what he loves the most is playing with his son, Orhan. Read Assistant Editor Zeba Imtiaz's interview with Fahad to learn more about his illustration process, approach, and inspiration. You illustrated two books for Pratham Books this year. What excites you about illustrating children’s books? The sheer act of drawing always excites me. It is a good break from animation, which is fundamentally the main thing we do. Unlike animation here I get to spend more time on one image. Exploring the details is always fun. How did you decide your approach for each of these books? I did Unni's Wish first. I really liked that story because I was able to relate to it somehow. And to add to that I took a trip to this place called Wagamon and stayed in a house like the one I drew. That was fun. I always enjoyed drawing black and white images. 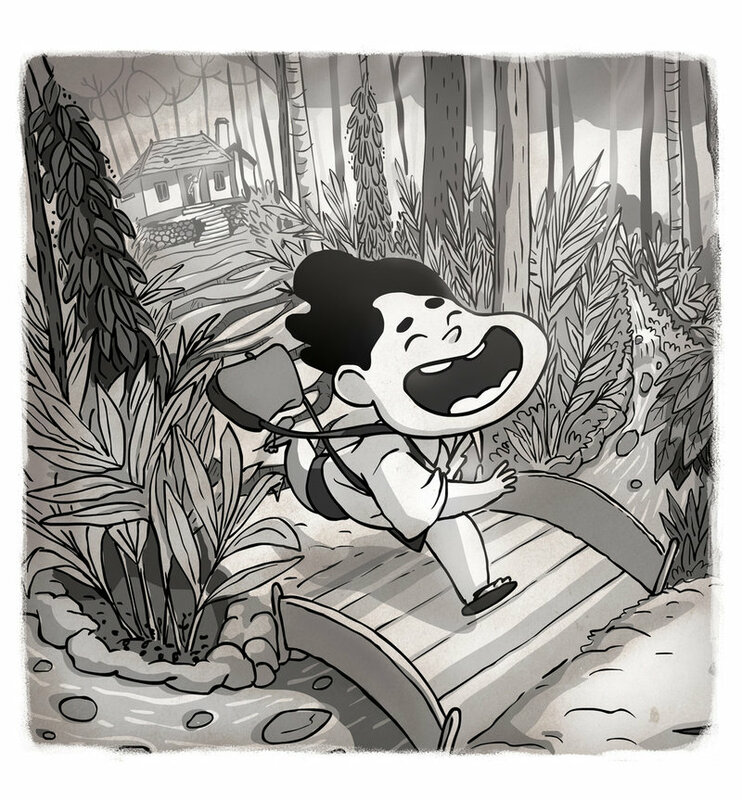 Just with shades of grey you can add a lot of depth and it’s not that common to see children's book in Black & White. The story supported it. Fly in Space on the other hand, I took a different route of flat colours. In fact, fly as a character is something I did recently in an indie comic called Autobiografly. Though that was not exactly for kids. But here I tried to keep it simple. Even this story was really inspiring. I believe the concept is the king. Do you think there’s a difference between illustrating for children and adults? Fundamentally, there is not much difference between illustrating for adults or children! For both, it's the child in me who is drawing. The content makes the difference. Being a father of a 2 year old I think sometimes we underestimate kids. They are way more intelligent than us. You have created some absolutely wonderful and memorable characters in your stories. Could you tell us more about the process for creating these characters? Like I mentioned the story was my base, then I gathered all my memories of being a Malayali boy, and to add to that, the trip to Wagamon really helped. There we met a boy who helped us get back to our cottage through the coffee and cardamom farm. Putting all these together I drew Unni, a boy with little over grown curly hair, who wears an oversized shirt, who looks a bit like my son. What we are exposed to, is what we are. 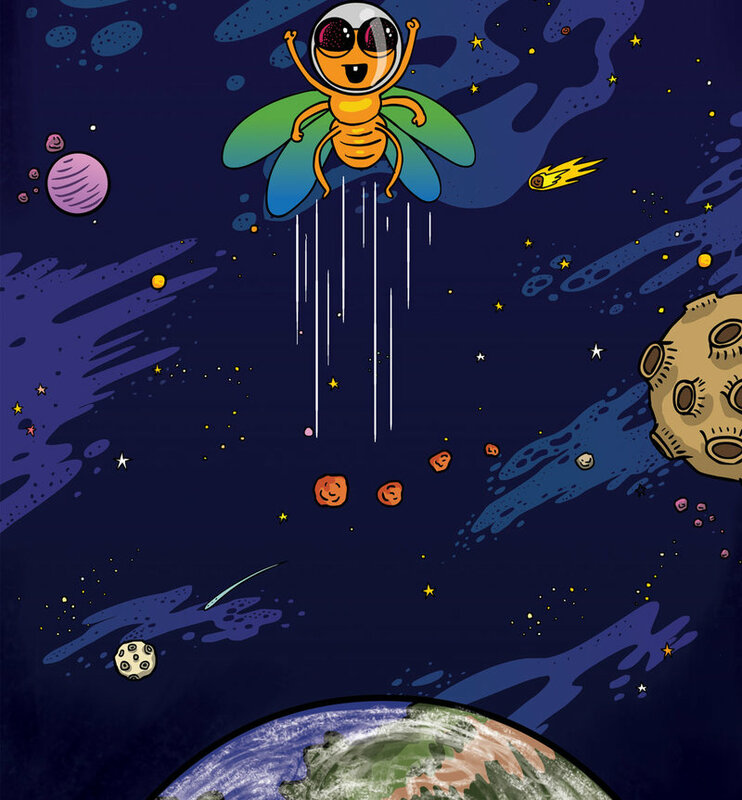 For Fly in Space again like I mentioned the fly as a character is something I have been working on from my previous work. I tried to keep up the age. Your visual narratives contain a distinct sense of humour. Is this something you consciously do? Being in Kerala I am exposed to lots of uncensored humour. I think that is very important to be able to think free. I tried to be there in each of the frames I drew, say if it's Unni enjoying the wind from fan or drinking chilled lime juice. I was aware of what I drew by might not be with too much planning. 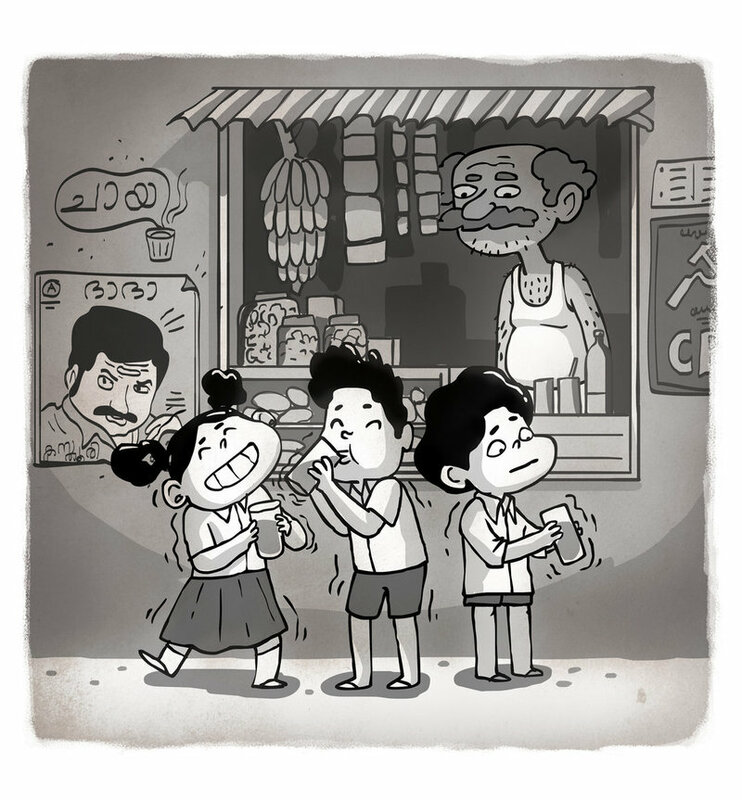 You run a studio called Babakiki along with your wife Sunaina Coelho, also an illustrator and animator. What sort of projects interest you? We are interested in working on socially relevant projects. Anything that gives us an opportunity to create something new: idea-wise or technique-wise. We believe animation and illustration is a very strong medium that can communicate universally. What do you most enjoy drawing? That is tricky question! That’s like asking a foodie what you enjoy about eating. From time to time I immerse myself in studying anatomy, small details of structures or imaginary creatures inspired from what is there in nature. It is all connected. How did you decide that you wanted to be an artist? It's the other-way around, the artist decided to be me. I just went along. The sheer act of drawing always excites me. You can read Unni's Wish and Fly in Space for free on StoryWeaver in Hindi, Tamil, Marathi, English, and Kannada.